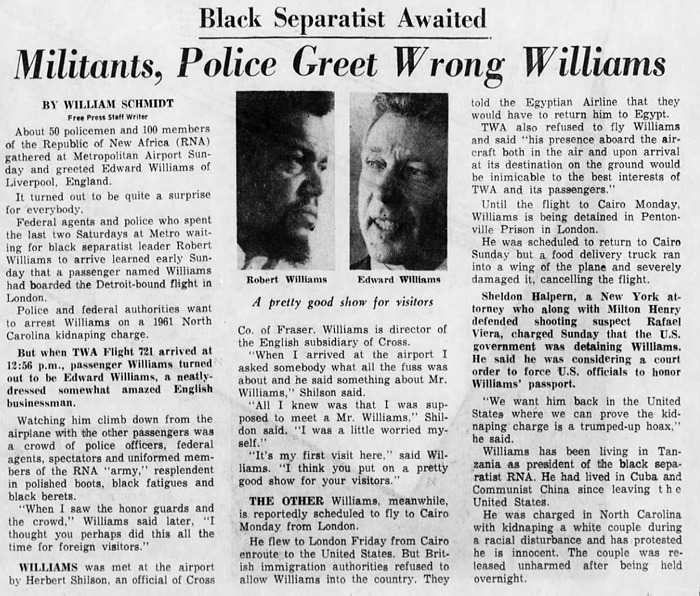 September 1969: 50 policemen and 100 members of the Republic of New Africa black separatist group waited at the Detroit airport for the expected arrival of the group's leader, Robert Williams. Authorities in London had tipped off the police that Williams was on the plane, and the police wanted to arrest him on a 1961 kidnapping charge. But it turned out to be the wrong Williams on the plane — not Robert Williams, the black separatist, but instead Edward Williams, "a neatly-dressed somewhat amazed English businessman." (Edward) Williams later commented, "When I saw the honor guards and the crowd, I thought you perhaps did this all the time for foreign visitors."